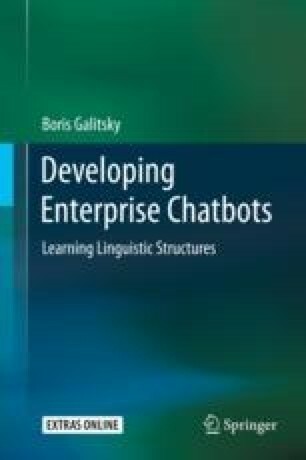 In this chapter we describe the industrial applications of our linguistic-based relevance technology for processing, classification and delivery of a stream of texts as data sources for chatbots. We present the content pipeline for eBay entertainment domain that employs this technology, and show that text processing relevance is the main bottleneck for its performance. A number of components of the chatbot content pipeline such as content mining, thesaurus formation, aggregation from multiple sources, validation, de-duplication, opinion mining and integrity enforcement need to rely on domain-independent efficient text classification, entity extraction and relevance assessment operations. Text relevance assessment is based on the operation of syntactic generalization (SG, Chap. 5) which finds a maximum common sub-tree for a pair of parse trees for sentences. Relevance of two portions of texts is then defined as a cardinality of this sub-tree. SG is intended to substitute keyword-based analysis for more accurate assessment of relevance that takes phrase-level and sentence-level information into account. In the partial case of SG, where short expression are commonly used terms such as Facebook likes, SG ascends to the level of categories and a reasoning technique is required to map these categories in the course of relevance assessment. A number of content pipeline components employ web mining which needs SG to compare web search results. We describe how SG works in a number of components in the content pipeline including personalization and recommendation, and provide the evaluation results for eBay deployment. Content pipeline support is implemented as an open source contribution OpenNLP.Similarity.